White muslin one-piece dress with long train; blue and brown cotton and silver embroidery of plant patterns; shirring at top of front; lace decoration around neckline. 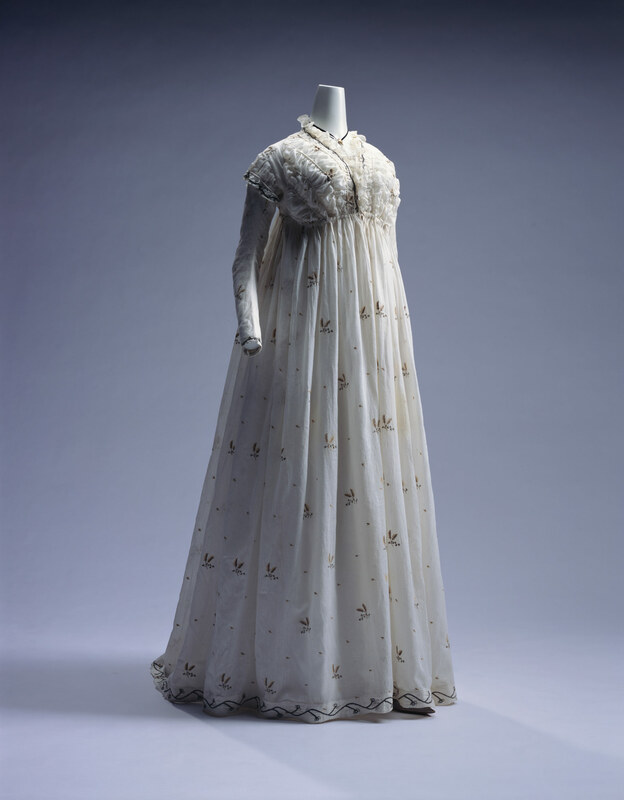 From elegant silk dress to simple cotton dress, the French Revolution in 1789 brought a clear shift in clothing styles. The popularity of white cotton muslin dresses became a craze at the beginning of the 19th century. The round gown has a high waistline reaching just below the bust, with the bodice and the skirt connected to form a one-piece dress. A forerunner of the simple muslin dress was one adopted by Marie-Antoinette. To escape the rigors of court life, the young queen took to dressing in a simple cotton dress and a big straw hat, and played at being a shepherdess at the Petit Trianon in Versailles. Around 1775 she wore a white cotton dress. Her portrait by Marie Élisabeth-Louise Vigée Le Brun (1755–1842) ("Marie-Antoinette", c. 1783, National Gallery, Washington) shows the "chemise à la reine". Looking at the materials and structures, we can say that the dress was a forerunner of the high waist dresses of the coming Directory period.